This year our students will be putting on three Christmas musicals to celebrate the most wonderful time of the year! Merry Little Christmas: On Thursday, December 13th at 6:00 PM, TK through 2nd grade will present a collection of holiday favorite songs to celebrate the reason for the season. Light of the World: On Tuesday, December 18th at 6:00 PM, 6th through 8th grade middle school students will present a theatrical performance with storytelling, singing, dancing, and worship. What Wonderful God-given Christmas Day: On Friday, December 21st at 10:00 AM, our School Band and 3rd through 5th grade students will present a poetic Nativity with story and song at our Birth of Jesus Prayer Service . As our PE Teacher, Mrs. Glidewell, continues her courageous fight with cancer, we remember to pray for her and her family. She is blessed with 3 beautiful children (Reece 15, Reagan 13, Rylann 7). During this Christmas season, let’s come together as a SAM Family and shower them with love and gifts. We would like to cover each child’s entire wish list. If you are able and willing to make a donation, we are asking for cash and gift cards. Generic gift cards such as Visa, Mastercard, American Express, Target, Amazon will be used to purchase gifts from the childrens’ Christmas wish lists. Please send your donation in a sealed envelope clearly marked “Glidewell Family Christmas” and ask your donation be dropped off in the Front Office by Monday, December 17th. 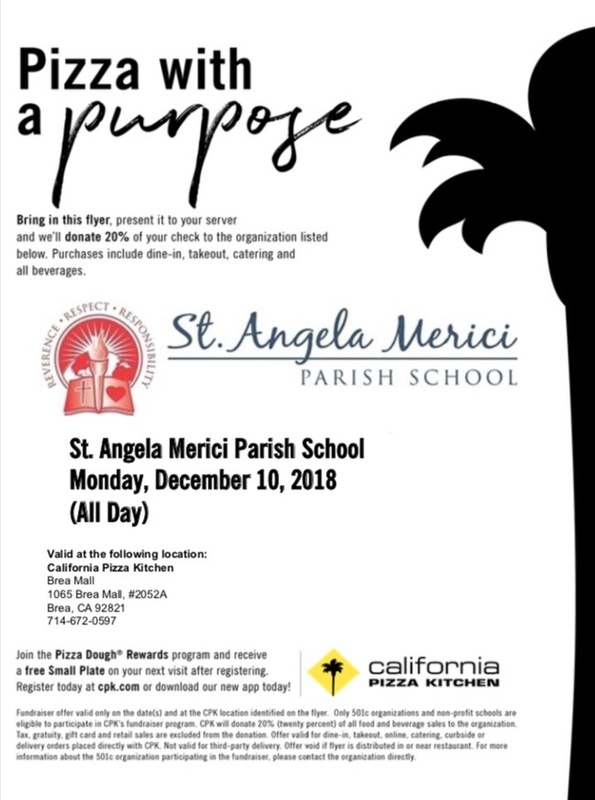 Our next Dining for Dollars event will be held at the California Pizza Kitchen in the Brea Mall all day on Monday, December 10th. Present the flyer to your server and CPK will donate 20% of your check to SAM. This includes dine-in, takeout, catering and all beverages. Mrs. Tapia will be throwing pizza from 5:00-5:15 PM in the kitchen; stop by and see how she does, you do not want to miss it! If we raise over $2,500 in total sales, someone at our school could win a free class pizza party! Students will be asked to write their grade on the flyer when they show it to the server, who will collect them to be tallied up to see which class had the most participation. We hope to see everyone there! Our next Used Uniform Sale is tomorrow, Friday, December 7th, after school at the lunch benches. The 8th grade class is giving you an incredible opportunity to do your Christmas shopping KID-FREE! On December 15th from 12:00-4:00 PM, 8th grade will be hosting Parents Day Out! The 8th graders and their parents will babysit your children (potty trained only) while you have a day to get all of your hustle and bustle done. 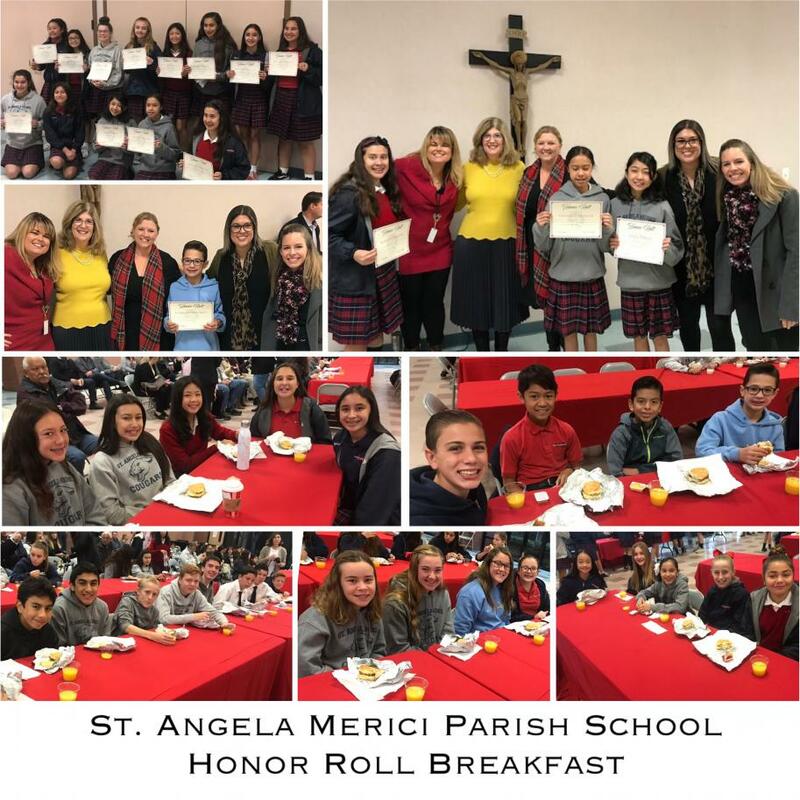 The babysitting will take place in the St. Angela Merici parish rooms. A hot dog lunch, snacks and water will be provided. Please complete the “Parents Day Out” form and return it to the Front Office by Friday, December 14th. Pre-registration is preferred but drop-ins are welcome. 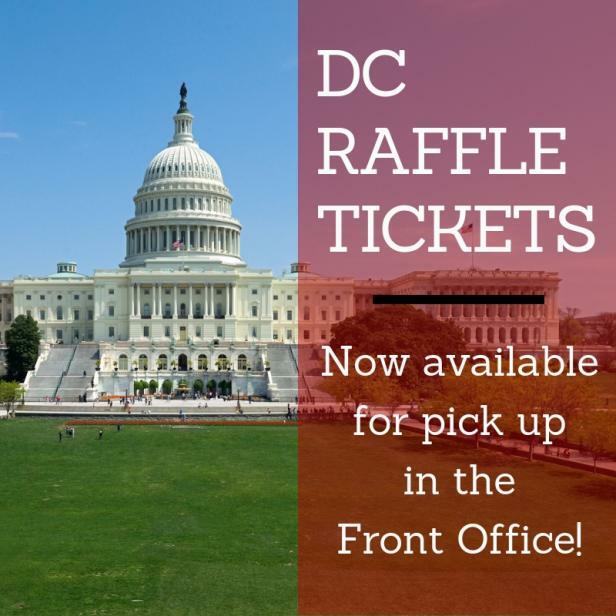 The cost for Parents Day Out is donation only for the 8th grade Wasington D.C. trip. All donations are greatly appreciated! St. Angela Merici Parish School is excited to announce our next Family Mass is Christmas Eve, December 24th at 4:00 PM. All grades are encouraged to attend and may participate as readers, greeters, ushers and choir by signing-up HERE. All students who attend this Mass & dress in their holiday best may wear free dress Monday, January 7th. 3rd through 5th grade students are invited to sing Christmas Carols at the Villagio at Capriana Memory Care Center in Brea on Wednesday, December 19th, at 9:15 AM. Students will arrive to the senior center dressed in formal uniform with holiday hats, scarves, accessories, etc. Questions can be directed to Miss Nina at gro.a1556000128erbal1556000128egnat1556000128s@ret1556000128ragmu1556000128abn1556000128 Please sign-up Here !!! Parents are responsible for providing transportation for their own child to the senior center and back to school after caroling. Address: 454 S. La Floresta Dr., Brea 92823. The Center is located next to Whole Foods Market. attention 3rd – 5th graders! The Cougar Store has items in stock that are available for immediate delivery! The Cougar Store has red/gray Spirit T-shirts and Cougar Hoodies in stock in all youth sizes and some adult sizes. T-shirts are $13 and Hoodies are $25. For more information or if you are interested in purchasing an item, please contact Noe Soto at (562) 822-1704. Email all information to gro.a1556000128erbal1556000128egnat1556000128s@nay1556000128rj1556000128" >gro.a1556000128erbal1556000128egnat1556000128s@nay1556000128rj1556000128 (cc: gro.a1556000128erbal1556000128egnat1556000128s@aip1556000128atj1556000128" >gro.a1556000128erbal1556000128egnat1556000128s@aip1556000128atj1556000128) by Wednesday afternoon.